Did we really not have a thread on this place? When I'm dashing through Falls Church mid-day, such as was the case last Wednesday, I usually stop in DC Sandwich for a quick bite. I had the #2 if memory serves, which is grilled pork. Extra meat for an additional $1.50. It was quite tasty, although the bun was a bit too flaky on the outside. Nonetheless, for the price, this is a superior nosh to anything from a fast-food place. There is simply not enough love on this Board for Le Bledo Bakery in Springfield. Part of the reason may be that it is difficult to describe. It's a legitimate French bakery where the birthday cakes are top-notch. But then, it's also a Vietnamese luncheon buffet, with nice quality and quantity for a good price. But then, it's also a Vietnamese snack counter, where you can get spring rolls and pork rolls that rival those of the Eden Center. But then, it's also a Banh Mi shop as good as, and cleaner than, DC Sandwich. But then, it's also a little Vietnamese grocerette where you can get the sticky rice sweets wrapped in banana leafs, along with other goodies. It's a little bit of a lot of things, and it's genuinely good. Rhone1998 -- didn't get a picture. But the meat and texture will be slightly different. My mom loves the pate at the Banh Mi So 1 place in Eden Center. Otherwise, I saw DC sandwich on Route 50 as a suggestion. In fact, I think the ham and head cheese combination might be not just the best banh mi in the area, but the best sandwich, period. It's always useful to calibrate your palate to your favorite critic's, so if you think this sandwich at Bí¡nh Mi DC Sandwich is perhaps the best sandwich, of any type, in the entire DC area, then you've got your critic. I worked around the corner for a couple of years a few years back. Quite good, but not distinguishable from other (good) bahn mi places, IMO. They have my favorite chicken sandwich - lots of roast chicken (sometimes including cartilage) and lots of mayo. Their chicken is distinguishable from Bale (Bale chicken always seems too shredded and dry) and the Eden joints (e.g., Nhu Lan, Banh Mi So 1, Les Baguettes - chicken in small pieces and too sweet). The bread is okay, maybe on the too doughy side. I've tried lots of their sandwiches (including tuna, sardine, fish cake, combo and grilled pork) and I like them all. I know many people like their grilled pork sandwich. 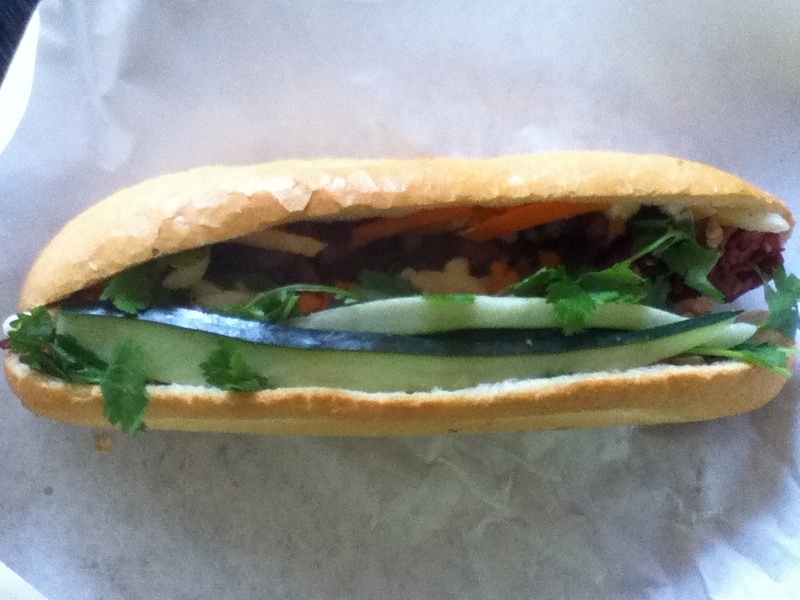 I think they make the best Banh Mi sandwiches for the area. I think they make the best Banh Mi sandwiches for the area. I think this calls for a side-by-side comparison between Banh Mi DC Sandwich and Dickson Wine Bar - with pictures. Found myself hunting down some furniture way out in these parts so I stopped in to grab a couple Banh Mi. Quite tasty indeed. Went with the grilled pork, the pork was finely chopped and had that slightly disturbing fake red food coloring look, and the tofu, very nice soft pillowy cubes of fried tofu. Both were stuffed with long slices of cucumber, do chua, jalapeno and cilantro. Banh Mi DC is the kind of Asian store that I like - lots of other prepared foods wrapped up to go. Big selection of various dried jerky. Although it is light on the grocery end of things - mostly standard issue jars of sauces and condiments (squid brand fish sauce etc.) which you can find at any well stocked Whole Foods. Too bad it's a long 8 mile drive from DC (Route 50 in Saturday afternoon traffic....sucky). I would definitely drop in again if I'm back out in those parts. I had driven by dozens of times and never stopped as some of my inlaws live right down the street. Finally went in yesterday and could not believe the amount of food for the price. We had the grilled pork as well as the veggie and the total was less than $9. Veggie was a little on the dry side but no complaints otherwise. I agree 110% on the prepared foods to go- love it. I had driven by dozens of times and never stopped as some of my inlaws live right down the street. Can identify. My in-laws had a house out in the Sperryville/Etlan area of VA. "No! I just know they'll drop in if I'm there, I'd rather have my teeth drilled!". Just happened to be in the area and checked out some of the items. Their "xôi gấc" use food coloring instead of gấc ̣( Momordica cochinchinensis). They should have changed the name to xoi red no 40 to be more honest. That's an indication of corner cutting establishment.